Sixteen-year-old Zoe McDowell has a bright future ahead of him. The Milwaukee-area native maintains a respectable GPA, is a standout track and football athlete on his high school teams, and plays an active role in mentoring young black students, like himself, through a club he helped start at his school. Now in his junior year, McDowell has his sights set on some of the top collegiate-level mechanical engineering programs in the nation. He also has aspirations to play football at the collegiate level. Either way, he’s college-bound. There’s never been a doubt in his mind about it. Unfortunately, the same can’t be said for many teenagers in McDowell’s demographic. For decades, reports have surfaced about the abysmal achievement gap that exists between black and white students in Wisconsin schools. Today, multiple news sources will confirm that Wisconsin ranks worst in the nation when it comes to the difference between how well black and white students perform on national benchmark tests, and the difference between black and white student graduation rates. 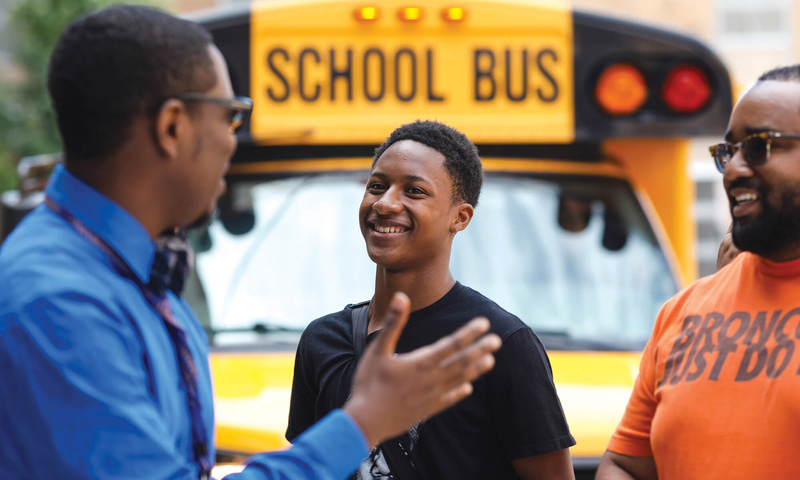 For the past several years, Moeser has played an integral role in fostering collaboration among Wisconsin schools in an effort to bring about change. He serves as executive director of the Closing the Achievement Gap Consortium (CAGC), which aims to embrace and change school practices, instruction, and methodologies that perpetuate achievement gaps. In 2012, when the consortium began, the CAGC had just four school district members. Today, the consortium has expanded to 26 public, private, parochial, voucher, and choice schools and school systems throughout Wisconsin. Concordia is its only higher education partner. The group works to address Wisconsin’s achievement gap issue in a number of ways. It annually hosts a career fair to attract high-quality teachers to schools where achievement gaps are most prominent. It also offers Equity Institutes over the summer for CAGC members. Last year’s Equity Institutes alone had more than 300 Milwaukee-area educators poring over school data and wrestling with tough questions in order to put research-driven strategies into practice within their schools. The CAGC is also responsible for hosting the annual African American Male Initiative (AAMI), a summertime initiative that encourages young African American men to succeed with the intent of pursuing higher education. During the four-day event, students stay overnight in CUW dorms, network with dozens of other black teens and young adult mentors, hear addresses from prominent and successful black men in the community, and participate in a variety of goal-setting and personal development exercises. In its inaugural year three summers ago, AAMI drew a modest 37 students, including Zoe McDowell. Last year, more than 150 youth attended. This summer, CAGC will host its first African American Female Initiative. The event is made possible by a gift from the Waukesha County Community Foundation, who learned of the success of AAMI last summer and wanted to replicate it with young women. While there is more work to be done on the achievement gap front, Moeser says he’s thrilled with the progress that’s being made, and he’s taking advantage of opportunities to champion the group’s efforts. Most recently, he was invited to present at the 2018 American Association of School Administrators in Nashville, Tennessee, which drew approximately 5,000 educators.